For those with a fear of flying the temptation to use substances to help them through the journey can be great but there are several reasons why alcohol should not be relied upon to act as a crutch during this time. Why It Might Be Tempting. To use alcohol may be tempting as it can act as a way of numbing the experience and provide a false sense of security giving courage and bravado but these are not legitimate reasons for drinking alcohol. The drink should be taken infrequently and enjoyed for what it is rather than what it can do. Alcohol is a central nervous system depressant and can significantly impair both judgement and responsibility. It is likely, particularly for those who do not drink alcohol very often that they will become unbalanced, suffer from slurred speech and have disruption to their co-ordination skills. These indications may be enough for the airline to refuse passage of entry to the aircraft. It may be tempting for the phobic person to feel that they need another drink to bolster their confidence followed by another and another until they are no longer in control of their feelings and emotions,. This can happen very quickly, especially at an airport while there are time limits in place and a lot of alcohol may be consumed very quickly before a flight. The effects of the alcohol may not surface until the person has boarded the plane. It is likely that the effects will begin to wear off during the flight causing a panic attack to follow once the normal psyche has returned which can be dangerous and unpleasant for the staff, other passengers and not least the person with aerophobia. It is now well known that alcohol does not numb the psychological senses in fact it fuels any issues that are already in the conscious and subconscious. Those with a fear of flying will know that they are susceptible to panic and anxiety attacks which can be triggered or enhanced by the presence of alcohol.This gives a very strong argument for not using alcohol as a method of coping with air travel.In the short term it may be useful for helping relax the body but not for those who are already in a delicate state and prone to feeling anxious. If you have a phobia towards flying, these fears are likely to become worse with the use of alcohol. If the airline suspects that a lot of alcohol has been consumed and the physical or psychological presence of the person has been significantly altered it has the right to refuse admittance onto the flight and you may be ejected form the airport.The airline has a responsibility to protect its other passengers from any behaviour or actions that may be seen as threatening or distasteful which includes those under the influence of alcohol. 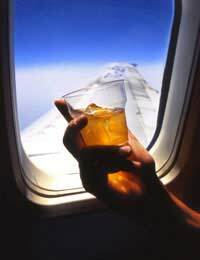 Alcohol can seem like an easy solution to gaining control over a fear of flying and can mask a strong phobia but it can in fact worsen the situation and cause a stronger reaction to the phobia either with the presence of alcohol in the system of when the effects have worn off and should always be avoided.